Governor JB Pritzker is on record as favoring term limits for legislative leaders, so we have a real opportunity to work in a bipartisan manner this year to enact legislation that would significantly improve our processes. I recently signed on as a leading sponsor of legislation that would enact term limits for the four legislative leaders in the General Assembly. HJRCA 12 would amend the Legislature Article of the Illinois Constitution to limit the number of years any lawmaker could serve as Speaker of the House of Representatives, President of the Senate, Minority Leader of the House, or Minority Leader of the Senate. Through the Amendment, legislative leaders would be limited to serving for a total of eight years in any one position and 12 years combined in two or more positions. Three of the four legislative caucuses have instituted term limits on leaders via internal caucus rules: House Republicans, Senate Republicans and Senate Democrats. House Democrats, ruled by Mike Madigan, have not set internal term limits. Every two years, House Speaker Mike Madigan requires two critical votes from Democrat members. The first is their vote to re-elect him Speaker of the House. This happened on January 9th. The second, in order to maintain near-complete, singular control over the legislative process, he requires them to vote to adopt his proposed set of House Rules, the rules that govern how the House of Representatives operates for the next two years. Last Tuesday, Speaker Madigan pushed through the same tired, draconian Rules that have been in place for decades. Madigan’s Rules were contained in House Resolution 59, which was supported by every House Democrat on the floor. 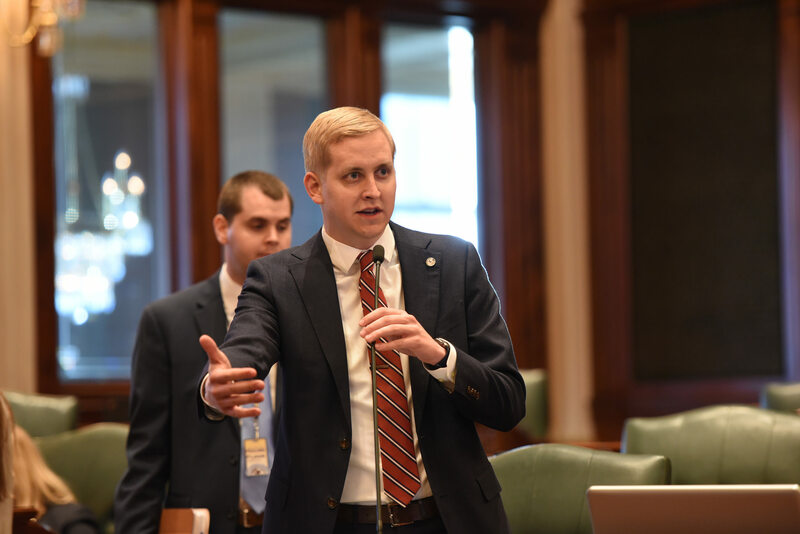 I was vocal with my opposition to Madigan’s House Rules, and said, “Don’t vote for rules today that give up the power that your constituents gave to you. Don’t vote for rules today that put the power in one person’s hand at the expense of the other 117 members of this body.” Click here to watch my floor comments during the Rules debate. These reforms would foster an environment of individual legislator empowerment, regardless of partisan affiliation. Unfortunately, Speaker Madigan did not allow a vote on HR 62. Earlier this month, my local district office moved to a new location in Dixon. For the last six years, my district office had been located in Rochelle, and it served us well. I had previously been able to host meetings in Dixon at the office of Senator Tim Bivins. With his retirement, I decided to relocate our principal office to Dixon. This new location will be a shared spot with Senator Brian Stewart, which will allow us both to serve our constituents well. The new office location is 105 E. First Street, Suite 110, in Dixon. The phone number will remain (815) 561-3690, and office hours will still be 9:00 AM – 5:00 PM, Monday through Thursday. Senator Stewart and I will be hosting an open house at the new office on Saturday, March 2, from 9:00 AM until 11:00 AM. Please stop by and say hello! The 90th District includes all or parts of 32 different municipalities, and I am very aware that many people would have to travel quite a ways for an appointment. Starting in March, a member of my staff will travel to a different 90th District Community one day each month so that our office’s resources can be brought to people in a location that is convenient for them. In addition, my staff is always available to travel to other communities for individual appointments with constituents. The 90th District is located in Ogle, Lee, DeKalb and LaSalle Counties. The District includes all or portions of the following communities: Amboy, Ashton, Byron, Compton, Creston, Davis Junction, DeKalb, Dixon, Earlville, Franklin Grove, Grand Detour, Hillcrest, Lake Holiday, Lee, Leland, Lost Nation, Malta, Mendota, Monroe Center, Nelson, Oregon, Paw Paw, Polo, Rochelle, Sandwich, Shabbona, Somonauk, Steward, Stillman Valley, Sublette, Waterman and West Brooklyn. The new numbers from the Commission on Government Forecasting and Accountability (CGFA), the nonpartisan budget-monitoring arm of the General Assembly, show a continued trend of slightly increased State revenue related to recurring year-earlier cash flow trends. Revenues for January 2019 failed to match the spiked revenues of January 2018, which were one-time-only numbers that reflected the passage of the federal Tax Cuts and Jobs Act (TCJA) in December 2017. The “Polar Vortex” weather conditions of late January 2019 created icy thermometers throughout Illinois. Frigid temperatures with dangerous wind chills have extended into February. Many schools, government offices and businesses had to close on January 30th and 31st, and the state’s economy was affected. When adjusted for wind chill, temperatures dropped below -40°F in many parts of the state. Warming centers operated throughout Illinois and emergency shelters gave spaces to the homeless. Last week members of the House began vetting the hundreds of bills that have already been filed in the 101st General Assembly. I am pleased to announce that I will once again be a leading voice in policy discussions that relate to delivery, access and funding of healthcare for Illinoisans. It’s an honor to continue in my role as the Republican Spokesperson for the Appropriations- Human Services Committee. Human Services is the largest area of state spending, and ensuring that taxpayer funds are allocated in a manner that maximizes people’s ability to access to the healthcare they need is vital. In addition to this leadership role on this appropriations committee, I will also be serving as the ranking Republican on the Prescription Drug Affordability & Access Committee. Access to affordable medications is another critical component of adequate healthcare, and I look forward to working with other members on this committee to improve overall safety, processes and outcomes. Other committee assignments for the 101st General Assembly include the Healthcare Availability & Access, and Human Services Committees, where a variety of other bills that address health concerns will be heard. Additionally, I will serve as a member of the Cybersecurity, Data Analytics & IT Committee. The ranking came from the nonpartisan Tax Foundation, which found that residents of 38 of the 50 states are expected to enjoy lower state and local per-capita tax burdens than residents of Illinois in calendar year 2019. According to the Tax Foundation, states with lower average per-capita state and local tax burdens than Illinois include the neighboring states of Indiana, Iowa, Kentucky, Missouri, and Wisconsin, and the large states of Florida, Georgia, Michigan, Ohio, Pennsylvania, and Texas. States with a higher average per-capita state and local tax burden than Illinois include high-tax California and New York. The statewide Partnership for Assessment of Readiness for College and Careers (PARCC) exam has been assigned to all public elementary school pupils since 2015. With three years of feedback from teachers, parents, and school administrators, the Illinois State Board of Education (ISBE) has examined and approved modifications to the exam. A significant number of questions have been removed and the English/literacy portion of the test has been reduced from 4.5 hours to 3.0 hours. These modifications are intended to respond to complaints, especially from teachers, that the PARCC test takes up too much time and interferes with actual teaching.